The annual St. Louis Cardinals Caravan will return to Joplin at noon Saturday, Jan. 14, in Taylor Performing Arts Center at Missouri Southern. The program will offer fans a chance to hear from current and former players, including Stephen Piscotty, Greg Garcia, Paul DeJong, Tom Lawless and Kyle McClellan. Broadcaster Tom Ackerman will serve as emcee. 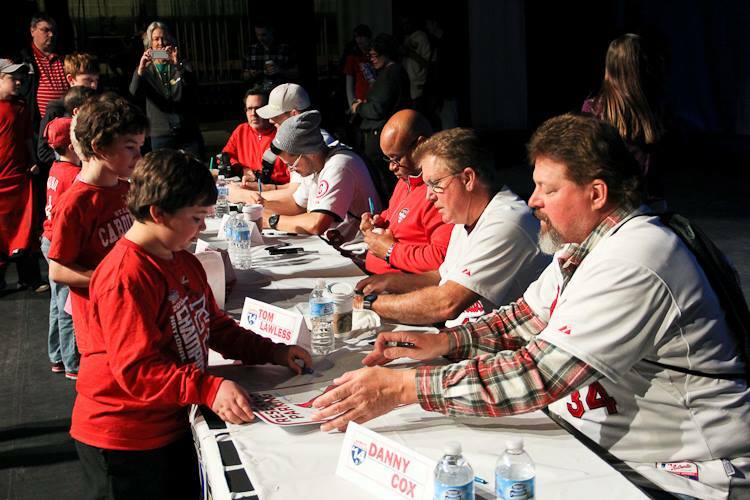 Current and former players sign autographs during the 2014 Cardinals Caravan. Autograph tickets will be available for the first 400 children age 15 and under. The United Way of Southwest Missouri and Southeast Kansas will sell raffle tickets for a chance to win Cardinals promotional items. Proceeds will benefit United Way programs. The caravan visit is sponsored by the Missouri Farm Bureau and a partnership between the Cardinals and Zimmer Radio, which airs games on AM 1230, The Talker. KGCS-TV staff and students will assist with the event, recording interviews and the program for broadcast. In addition, the Southern Athletic Department is offering a special to fans. Those attending the Cardinals Caravan who purchase tickets to the home basketball games that afternoon will receive a free concessions food item. Flyers with the coupon and details will be handed out at the event. “It’s a great opportunity for sports fans to have a full day at Southern, hearing from the Cardinals and then cheering on the Lions at Leggett & Platt Athletic Center,” said Stiles.